Lemon Dumpling 1/2 a lb of suet, 1/2 a lb of Bread, 6 ozs of sugar, the juice and rind of a Lemon, chopped fine 2 eggs. Mix all together, divide, into eight parts, boil them 3/4 of a hour then serve them up with melted Butter, sugar, & lime. To Preserve Apples in imitation of Ginger Take a quarter of a pound of the best whole Ginger set it on the fire with a pint of water, let boil sowly to one half weigh two pounds of sugar with two pound of unpeeled Ribston pippins, put the sugar into the ginger water then peel and core your apples & cut them as near the shape of ginger. 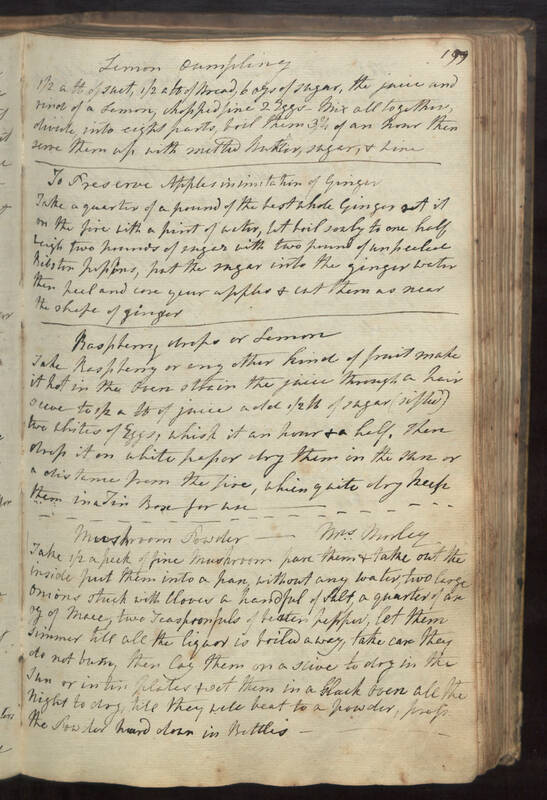 Raspberry drops or Lemon Take Raspberry or any other kind of fruit make it hot in the oven strain the juice through a hair seeve to 1/2 a lb of juice add 1/2 lb of sugar (sifted) two whites of Eggs, whisk it an hour & a half, then drop it on white paper dry them in the [oven?] or a distance from the fire, whin quite dry keep them in a Tin Box for use. Mushroom Powder - Mrs. Morley Take 1/2 a peck of fine mushroom pare them & take out the inside put them into a pan, without any water, two large onions stuck with cloves a handful of salt, a quarter of an oz of mace, two Teaspoonfuls of beaten pepper, let them simmer till all the liquor is boild away, take care they do not burn, then lay them on a seive to dry in the sun or in tin plates & set them in a black oven all the night to dry, till they will beat to a powder, press the powder hard down in Bottles.